Graphic designers play several vibrant roles that ensure the development, survival, and sustenance of the society. It is no exaggeration to say that the products and services provided by Graphic designers ensure the smooth running of activities carried out in the society. Graphic designers educate, warn, inform, notify, entertain, etc. 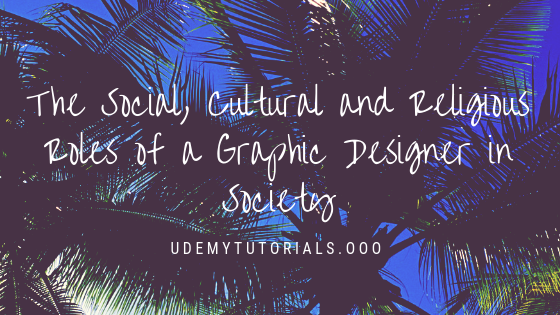 The Graphic artists play significant social, cultural and religious roles in the society. Societal activities are promoted through the use of his products. For instance, the entertainment industry relies heavily on products in Graphic design. Cinematography, which is an aspect of the area is used for entertaining the young and old through its animated images and cartoons. Products in Graphic arts such as the production of hilarious books and other comic magazines that carries humorous stories coupled with satirical images are a mouth watering form of entertainment to the general public especially students. The activities of the entertainment industry are communicated to the general public through communication tools such as posters, banners, flyers, handbills, etc. The identification of players and teams which are through jerseys bearing their individual names and flags of their respective countries are made easy as a result of printing.The programs of various sports are communicated to the general public through graphic design communication tools such as posters, banners, handbills etc. In the traditional system of governance where a chief and his council (body of elders and other sub-chiefs) exercises authority over his subjects or members of the society, Graphic design products are greatly at work. Festivals, ceremonies, and rituals that are done in the society rely extensively on his products. These activities are relayed to the general public through posters, banners, flyers, and billboards. Cultural fabrics are printed with symbolic patterns that portray and educate us about our rich cultural heritage. Religious activities of the various religious bodies in the country are effectively carried out as a result of Graphic products. The location of the various temples, churches, shrines, and cathedrals are as a result of the signboards, signposts, billboards and banners carefully situated at vantage points. Without them, it would be very difficult for people to find the locations of the countless religious associations in the country. The printed attires which help us to readily identify roles that members of the religious group play. How will a new person in the church, mosque or shrine identify the leader of the religious group if not through the printed attire that they wear? Those with duties such as ministerial duties like ushers are identified by the printed stoles that they put on. Members of youth, men and women's associations of several churches are easily recognized through the T-Shirts and association's printed cloth. The interiors and exteriors of religious buildings are lavishly decorated with several wall hangings, buntings etc. Also, the numerous posters, banners, flyers and handbills that inform members of religious programs, meeting days and times, harvest and fund-raising ceremonies are made possible by the Graphic designer. Church items are safely kept because of the comprehensive labels that have been done on them. The stickers, key holders, bangles and other church paraphernalia that attracts and draws new members into the various religious groups are as a result of him. In some religious denominations, special books which are believed to be 'holy' such as the Bible and the Koran are used for teaching and disseminating the doctrines of the religious bodies. It can be said without exaggeration that the Graphic designer assists greatly in the smooth flow of religious activities carried out by the various religious bodies in the country.